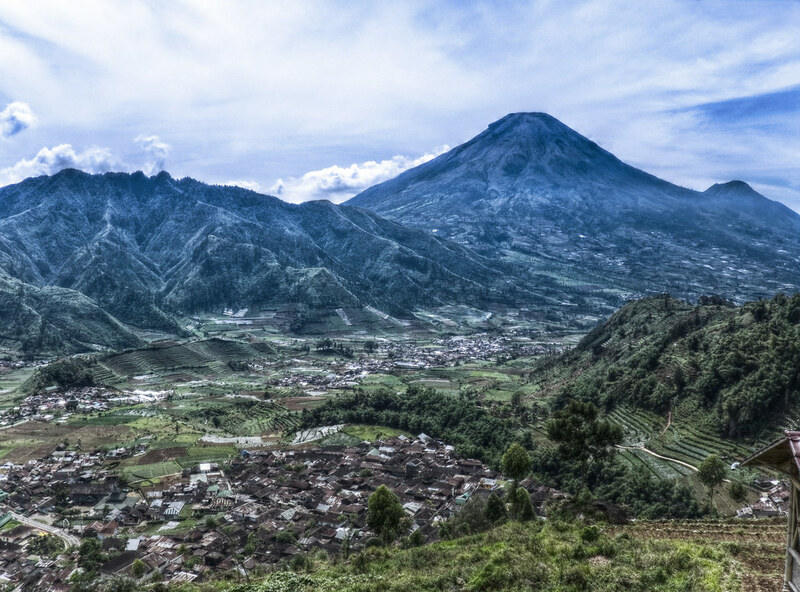 Dieng Plateau is a volcanic caldera complex located in Central Java. 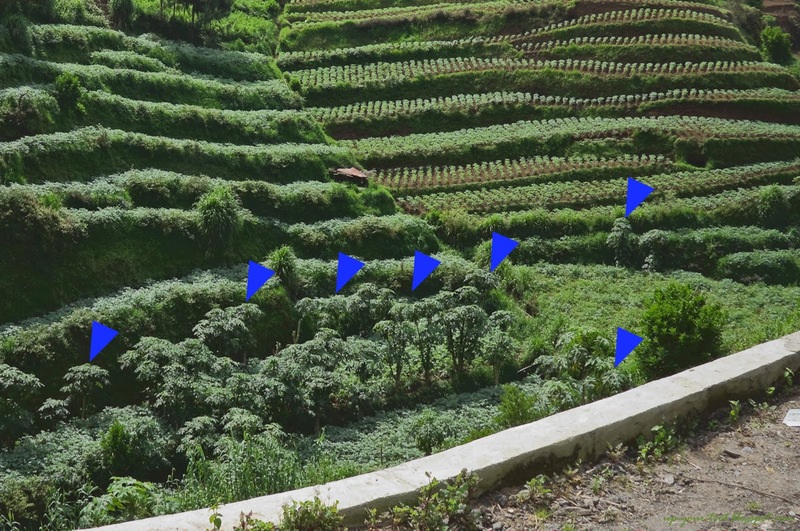 As the plateau is located 2000m above sea level, the cool weather allows for the cultivation of many temperate and sub-tropical vegetables and fruits. There are two kinds of fruits grown in Dieng that I would like to share here. Coincidentally, both fruits have the specific epithet pubescens, meaning hairy or covered in hairs and are not commonly seen in warm, lowland tropical climes. View of the villages below and mountains to the southeast from the viewing tower on the way up to Dieng Plateau. The two widely sold fruits in Dieng. One is a chilli pepper and the other is a relative of the papaya. The first one is a fruit that grows on a papaya-like trees that is planted along the slopes on the road up to and on Dieng Plateau. Indeed one can see signs on stalls like 'bibit Carica untuk dijual' (meaning Carica seedlings for sale) or 'Oleh-oleh Khas Carica Dieng' (Speciality food gift of Dieng Carica). Carica is the genus of the papaya fruit but the trees here are distinctively different from the lowland papayas. They have more finger-like leaf lobes and the fruits are small and very angular. Fresh Vasconcellea pubescens in trays, boxes of processed Vasconcellea pubescens in syrup (sold as Carica Dieng) and Dieng chilli pepper on a stall at the Candi Arjuna complex in Dieng. This is actually Vasconcellea pubescens. It was formerly known as Carica pubescens Lenné & K.Koch, Carica candamarcensis Hook.f., or Vasconcellea cundinamarcensis V.M. Badillo. 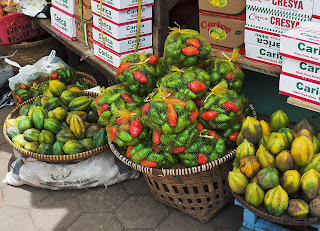 Hence the locals here call it Carica and markets the product as Carica Dieng. In other places, they are known as mountain papaya or mountain pawpaw. Vasconcellea pubescens are native to the Andean range on the northwestern part of South America from Colombia south to central Chile, and typically grows at altitudes of 1,500–3,000 m (4,900–9,800 ft). They are also grown on the mountains of Sri Lanka and South India has has been known to do well at 1800 ft (549 m) in Puerto Rico. This plant is apparently resistant to papaya viruses thus is of great interest to plant breeders. 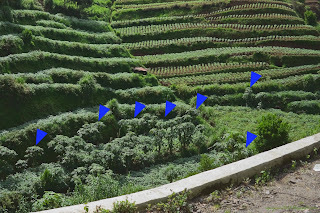 Along the way, one can see papaya-like trees of Vasconcellea pubescens being grown on the lower slopes of the terraced hillside. Sometimes called Papayuela, the outer flesh is firm, and needs to be cooked (e.g. in syrup as commonly sold in Dieng) and has a texture that is reminiscent of peaches. The inner pulpy flesh and the seeds can be eaten raw, and taste like a cross between passion fruit and pineapple to me. 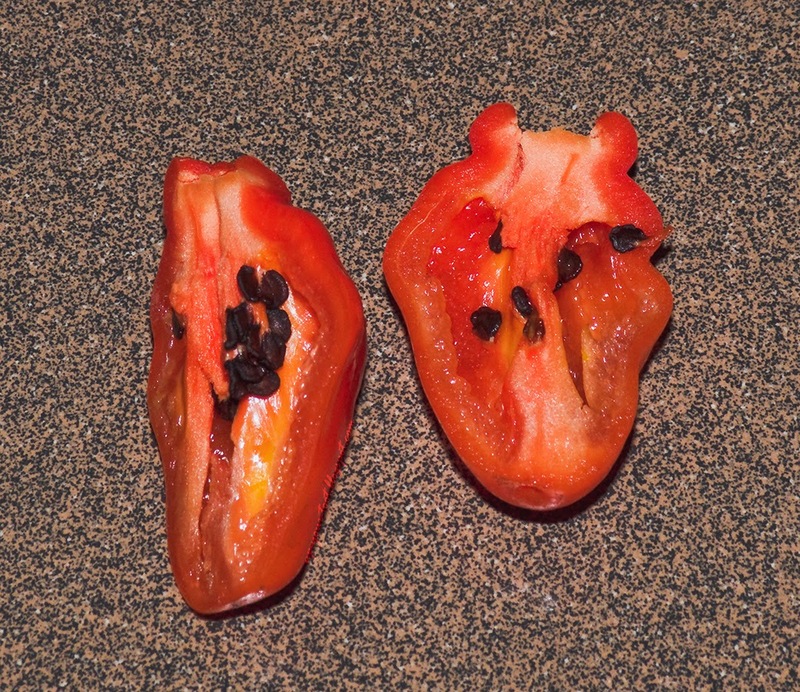 Seeds are dark brownish and surrounded by a jelly sac, very much like Carica papaya. The mountain pawpaw or papayuela. In Dieng, you can buy processed Vasconcellea pubescens fruit in syrup or get them fresh. The fruit does not seem to like heat, and turned soft rather quickly in the lowland heat. I actually didn't buy any, for I am always vary of anything papaya (they give me the runs). Luckily our good friend and local guide, Ary bought some and insisted we try. The aroma and acidity of the pulp would probably go well with yoghurt and ice-creams in the same way as passion fruit pulp does. 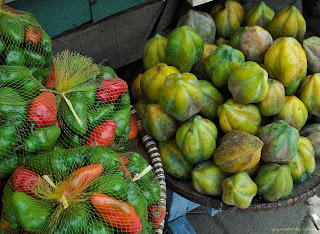 It is an interesting fruit that is not so commonly seen, especially in the warm tropics. Another Andean plant fruit that is grown and sold in Dieng is the cabe gendot or gendol. This chilli pepper is shaped like a jalapeno, but my oh my is it hot! Many people are confused and think that this chilli pepper is a Capsicum chinensis (aka habanero) type but cutting the fruit open provides you with the identity of this cabe gendot. Firstly, the flesh is thick, and secondly, the seeds are black! C. chinensis have thin flesh and yellow seeds. The only domesticated chilli pepper that is widely grown with black seeds and thick flesh is Capsicum pubescens Ruiz & Pav. 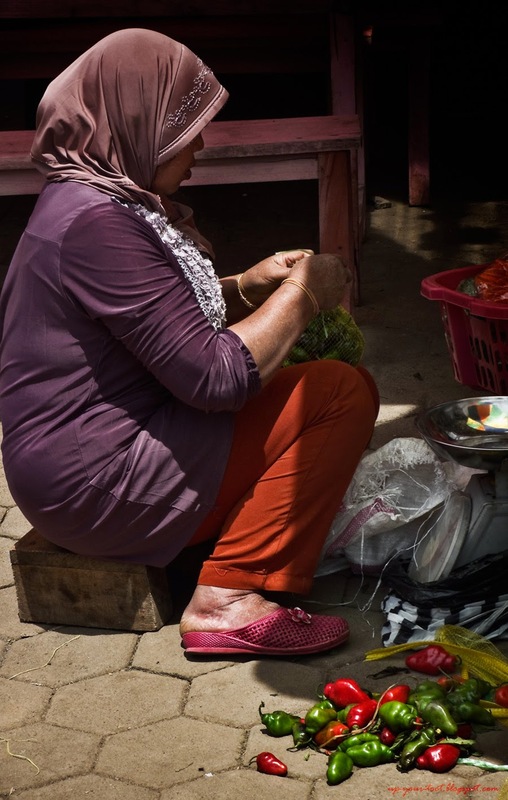 A lady bagging Capsicum pubescens for sale at Dieng. They tend to sell them green. At some stalls, you can pick the cabe gendot that you want, be it red or green. The black seeds and relatively thick flesh for a small chilli pepper is a dead giveaway of its identity. 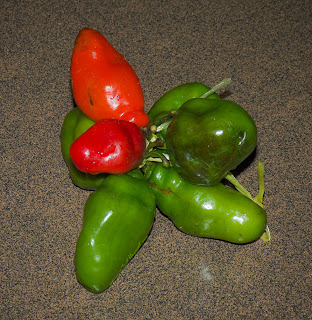 Bite into the flesh of this chilli pepper, and you will notice a slight bitter taste similar to a green bell pepper. This is masked by the somewhat fruity taste of the chilli pepper (citrus-like to some people). Then the heat kicks in. They burn your lips and hands, especially if you handle the placenta and seeds. Getting the seeds out resulted in my hands having burning sensation that lasted till the next day! And you wouldn't want to know how it felt when the chilli pepper came out on the other end! A bunch of Capsicum pubescens tied with raffia string. The shape of the chilli peppers looks like a long rocoto chilli pepper. The specific epithet pubescens means hairy as the leaves and plants are hairy. They have purple flowers and is regarded as one of the more primitive Capsicum species. The plants are known as tree chilli as the roots lignify rather quickly and they sometimes takes on a vining habit. 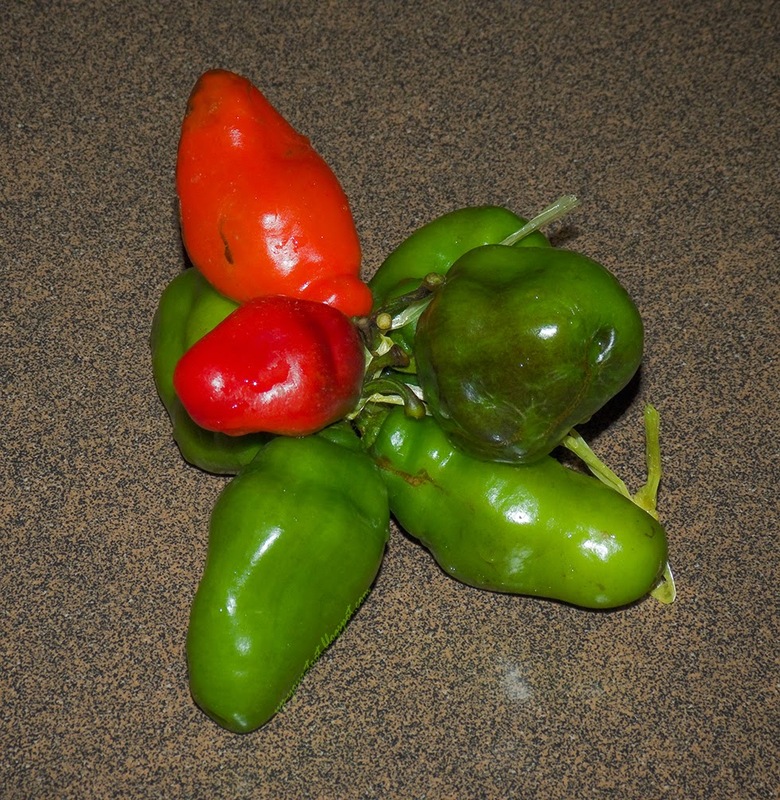 Some examples of C. pubescens cultivars include Rocoto, Manzano and Canario. So if you go to Dieng in Central Java, don't forget to try the Carica Dieng (shouldn't they call it Vasconcellea Dieng now?) and the cabe gendot Dieng. 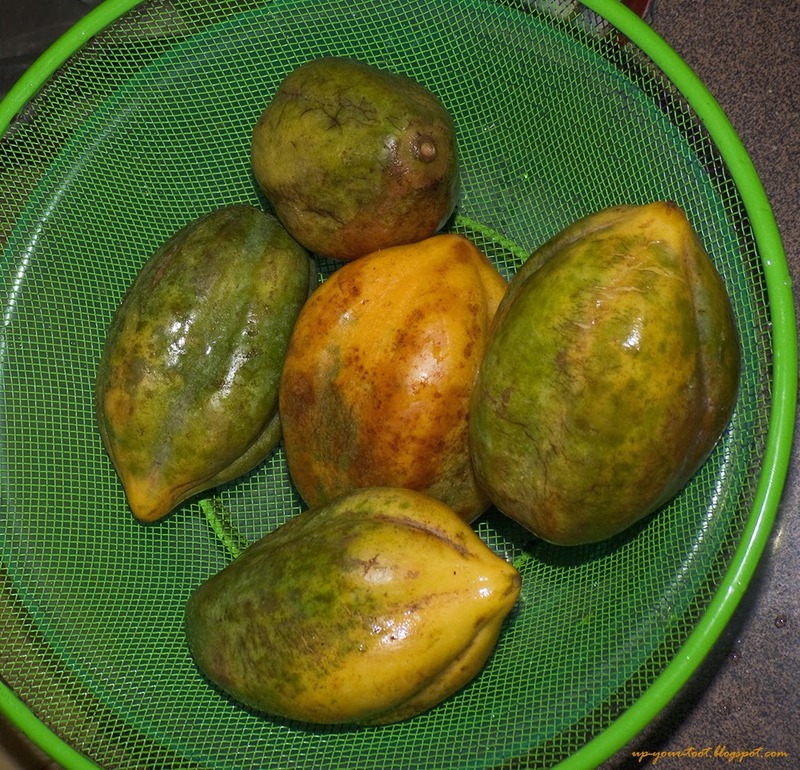 Carica looks like a mix cross of papaya and cocoa hehehe...is it with yhe Queenslander called pawpaw. Always got confuse why papaya is called pawpaw. Seronoknya kalau dapat pergi situ cantik nyaman. Cabe Gendot seeds is similar with terung susu kambing. It is gonna be hot collecting the seeds will sting the hand for several days. Sakit nak pakai contact lens. Yup. I was shivering at the viewing tower trying to take photos. Around 15deg. Apparently C. pubescens can grow if temp are constant around 25deg or so and on shady spots, they become vining and climber like. A whole day 6 seater with driver from Yogya cost us Rp 800,000.00 to see the viewing tower, several candis, the sikidang crater (bubbling sulfurous water) and the telaga warna (also bubbling with gas). It is better to do homestay there (i.e. two day trip) and wake up to see sunrise if you have the time. They have the tree dahlia there and dandelions everywhere! Oh wow miss tree dahlias, mauve or white? Dandelions dah buat rumah kat sana ya. Phobia even they are edibles boleh campur dalam omelette sebab kebun dulu asyik kena cabut with longggg taproot. Mauve. Tak terfikir pula nak cari kudup yang dah kering untuk biji. I cuba cabut dandelion sebab susah nak tanam kat sini tapi akarnya kuat, semuanya putus kat base of rosette. Kat sini, spider mites will kill them rapidly. In the end, i kutip biji je. Yes the dandelion roots is very strong. My kids like tu blow the dandelion pom pom stalk dulu. Oxalic kuning bunga tu pun phobia susah nak eliminate kat kebun lama. Kebun sekarang takut segala jenis amaranth. Ahahaha, saya tahap budak-budak lagi kot, sebab suka je tiup pom-pom dandelion.